Authored by nibags on Jan 16 2019, 8:59 AM. Allow regular expressions after ": "
Before, <<Foo was highlighted as Heredoc. 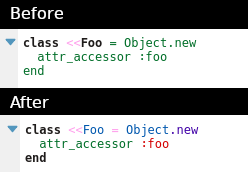 I did some tests in Ruby 2.6.0, 2.5.1 and 2.3.8, and Heredoc isn't considered in the code: class <<Foo, class <<21, class <<"Foo" or class <<-Foo, so I can say that the fix is correct. Improve highlighting of identifier quotes. Now you need to close quotes to highlight the HEREDOC. For example, HEREDOC was previously highlighted as: <<"HEREDOC , <<HEREDOC"
I also added a modeline to force the use of tabs as an indentation, since the file uses tabs.